Sealed bearings won't need lubrication during the working lifetime of the knife, which is fully warranted against defects for two years after purchase. The air-cooled motor's vented housing is styled for a comfortable non-slip grip, and the safety trigger works with only light pressure. Switch between six-inch or seven-and-a-half-inch serrated blades depending on the size of the catch. The serrated high carbon stainless steel blades hold a useful edge for many hours of operation and are replaceable. The Rapala's 18-foot power cord gives you plenty of room for working from the back porch, and that unlimited power supply will handle any number of fish. The only real quirk is that these electric knives are built for intermittent use, and with limitless power, it's easy to overdo. Cut for a while and then let the motor cool down. If you cover the vents in the handle with your hand, you'll decrease the knife's ability to shed motor heat and cause more problems. Also remember that even with the motor behind it, this is a fillet knife meant for light cutting and not a power saw. Use something else for the tougher work of dismembering the catch and cutting through bones. The Rapala 110VAC knife comes with a handy molded plastic storage case for tucking away the whole kit in the boat or the car. 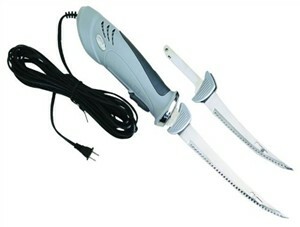 See the Rapala Proguide Deluxe for another fine electric knife with varied power options.